A 'WBM' road stands for 'Water Bound Macadam' road. 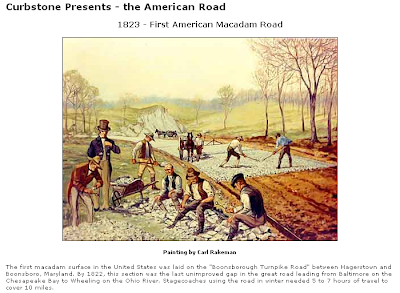 It derives its last part of the name from an Engineer named Macadam who proposed and designed the structure of this road section. The other part of the name stands relevant as this road type essentially uses the principle of binding the various in-situ layers of boulders, stones, fine aggregates and fillers as moorum, stone dust, sand, etc. Subgrade preparation : This includes removal of the top soil, vegetation and loose sub-surface (if any) up to the desired reduced levels. The subgrade should be well consolidated and compacted to a camber of 1 in 60 or 1 in 48. Sub-base and base preparation : This is the base course and is also called soling. It comprises of well compacted base made out of rolling boulders/ kankar/ overburnt brick ballast in three layers, viz., the larger sized boulders (sized 63mm to 40mm) evenly placed as the bottom-most layer; medium sized aggregates (sized 40mm to 25mm) evenly placed as the middle layer; and smaller sized aggregates (sized 25mm and down) evenly placed as filler material as the top layer. The layers should be compacted well longitudinally in pre-determined sections by a 10 tonne roller with the final compacted layer being about 125mm thick. A second course of such sub-base commonly known as base and comprising of three layer system should be provided over the well compacted 1st course so that the total compacted thickness of the sub-base and base is about 250mm. The compacted base should be dry-rolled followed by saturating it well with water and subsequent wet-rolling until the base becomes cohesive and fully saturated. Surface dressing : The sub-base & base are allowed to be bone dry over a period of time. The loose dust and dirt are removed by a combination of wire brushes, hard brush brooms and soft brushes so as to expose clean metal surface to a depth of 6mm to 12mm, but without loosening the embedded stones. Asphalting : The temporary and semi-permanent roads involve only the above mentioned steps. However, asphalting is done for making the roads all-weather and durable. The process includes binding the surface with alternate bituminous tack coats and applying a 40mm layer of bituminous concrete (commonly known as 'premix'). The final layer of 25mm thick bituminous mix of fine aggregates and a seal coat are applied as a wearing course and to make the road water tight for enhanced durability. SUBSCRIBE to get B-n-M's updates and feeds right there in your INBOX. Thank you so very much for this fundu info. Now I can nod in front him in affirmative much more positively rather than nodding only because he is my boss, and boss is supposed to be always right (u know what I mean!) ha ha! Jokes apart, and just for curiosity sake, can u pls tell if this WBM forms basis of all types of roads? Yupp, jokes apart, WBM perhaps forms part of all kind of modern permanent roads... be it black-top bituminous roads or concrete road tops as all of such roads have Water Bound Macadam (WBM) as the sub-base on which the final topping (finishing) layer is finally laid. The only exceptions would be structure steel bridged roads, which would require steel and no WBM! Hi! 'Team Bricks-n-Mortar' appreciates your writing-in to us. Your suggestions/ comments/ feedback/ contributions help us bettering our blog. Join Us for having a meaningful symbiotic experience and relationship with our community. We would love to be of an help to you. South Delhi's Bus Rapid Transit (BRT) Corridor -- A Boon or a Nuisance for Daily Commuters & Motorists? [PropertyTalk]: 1BHK/ 2BHK/ 3BHK... | What is Full form of BHK? | Meaning of BHK? | What is BHK? Hi! We are a group of Civil Engineers working in different fields of Civil Engineering, viz., Design, Construction, Consultancy, Project Management, Interior Design, and the likes. We would like you to JOIN US for having some meaningful symbiotic relationship whereby we would love to sort out the doubts & queries everyday life of the common men who plan to carry out a Civil related work (be it construction or upgradation or maintenance or the likes of their homes/ offices/ etc. ), or who simply are inquisitive of the basic Civil Engineering related things. WE WOULD LOVE TO BE ANY HELP TO YOU. Your comments/ suggestions/feedback are welcome. If you would like to patronize this weblog, or would like to get regular updates, do join us by subscribing to our Feeds (SUBSCRIBE NOW). "SWASTIK" -- The lucky, auspicious and basic building block of life as per Hindu Mythology. BRICKS-n-MORTAR.com is protected by Copyscape. Please do not copy/lift content, pics, etc. without written permission & giving due credits to us.